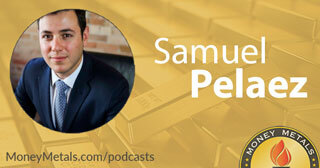 Frank Holmes on Resource Commodities and Currencies: Reaching an Inflection point? 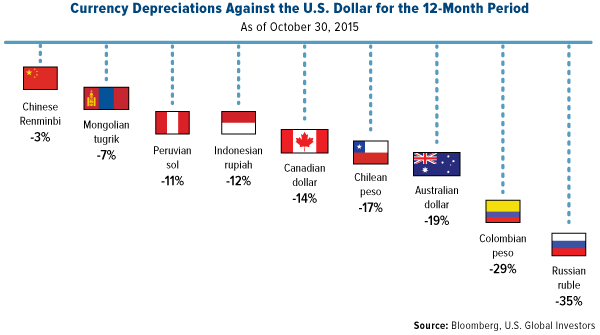 Since July 2014, the U.S. dollar has appreciated more than 20 percent. This has had huge implications for net commodity exporter countries, both developing and emerging, which typically see their currency rates fluctuate when prices turn volatile. 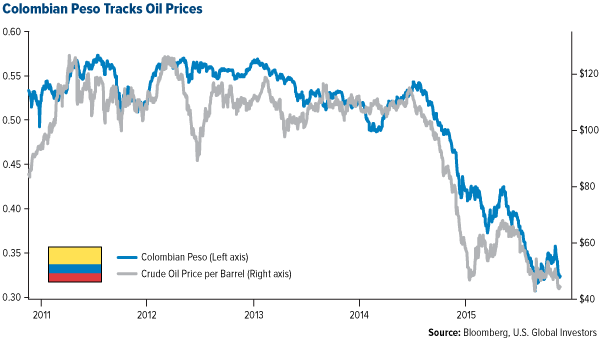 The main reason is that most commodities, including crude oil, metals and grains, are priced in U.S. dollars. They therefore share an inverse relationship. 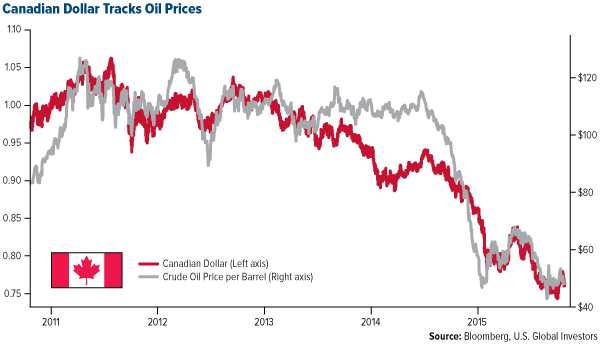 When the dollar weakens, prices tend to rise. And when it strengthens, prices fall, among other past ramifications, as you can see in the chart below courtesy of investment research firm Cornerstone Macro. Indeed, commodities have collectively depreciated close to 40 percent since this time a year ago and are at their lowest point since March 2009. 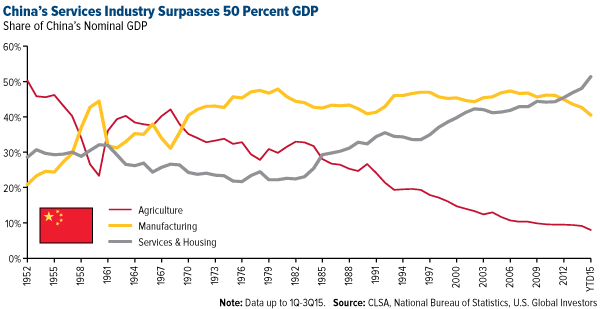 We might very well have reached an inflection point for commodities, which opens up investment opportunities. The number of developing and emerging markets that are dependent on commodity exports has risen in recent years, from 88 five years ago to 94 today, according to the United Nations Conference on Trade and Development (UNCTAD). Many of these countries—located mostly in Latin America, Africa, the Middle East and Asia—have a dangerously high dependency on a small number of not only commodity exports but also trading partners. For many suppliers, China is the leading buyer. But the Asian giant’s imports have been slowing as its economy transitions from manufacturing to services and housing, forcing many net commodity export countries to rethink their dependency on China. This is the position Indonesia finds itself in right now. As much as 50 percent of its total exports consists of crude oil, palm oil, copper, coal and rubber, for all of which China has historically been a vital importer. A stunning 95 percent of Mongolia’s exports flow into its southern neighbor, according to the World Factbook. And for Chile, commodities represent close to 90 percent of total exports, about 25 percent of which goes to China. 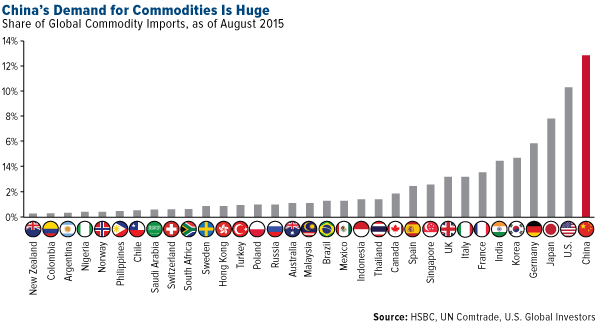 But countries needn’t have such a high dependency on commodities for their currencies to be affected. 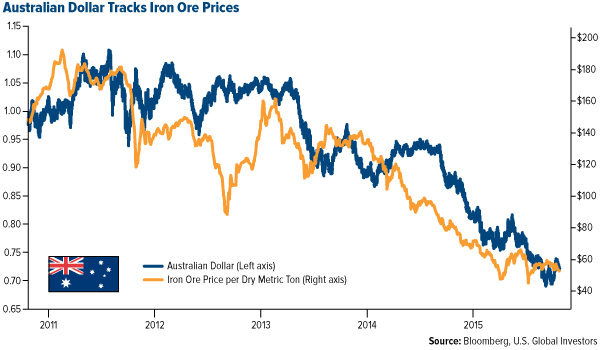 The Australian dollar, for instance, has a positive correlation with iron ore prices. About 98 percent of the world’s iron ore supply is used to make steel. So important is the metal to the state of Western Australia, where most of the continent’s deposits can be found, that every $1 decline in prices results in an estimated $49 million budget loss. The same relationship exists between the Peruvian sol and copper. Peru is the fourth-largest copper producer in the world, preceded by Chile, China and the U.S.
It’s important that we see stability in emerging market currencies, which would help support resources demand. We’ve seen some stabilization in the Chinese renminbi after it was depreciated in August, but a few others are down pretty significantly. I’ve shown a number of times that commodity demand depends on manufacturing strength, as measured by the J.P. Morgan Global Purchasing Manager’s Index (PMI). This indicator has steadily been trending lower. Although the reading is still above the neutral 50.0 line, commodity prices have reacted negatively. Cornerstone Macro believes both the Chinese and global PMI are “likely” to rise in October, leading to a full year of upside potential. If true, this is indeed welcome news, but it’s worth remembering that the PMI looks ahead six months, meaning it’ll take approximately that long for commodities to recover. 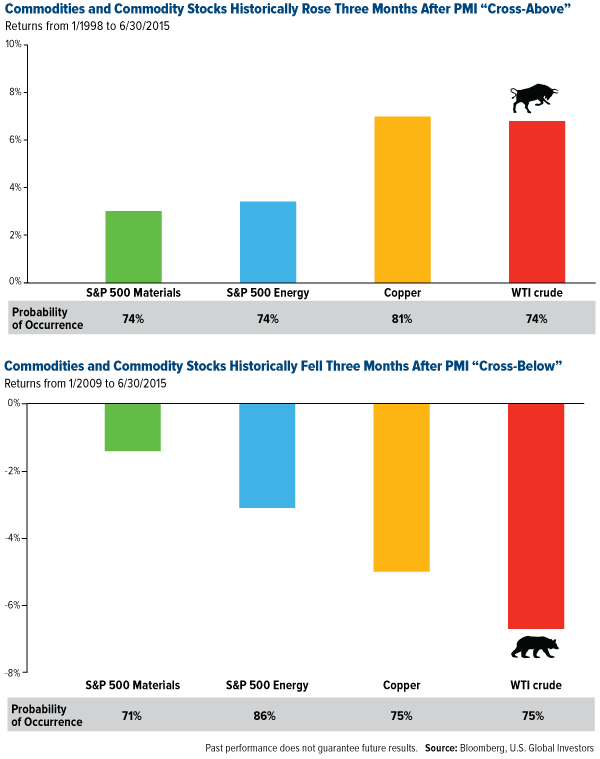 In any case, now might be a good time for investors to consider getting back into commodities and natural resources since we could be in the early innings of an upturn. I already shared with you that famed hedge fund manager Stanley Druckenmiller made a $323-million bet on gold, now the largest position in his family office fund. It’s also come to light that George Soros recently moved $2 million into coal producers Peabody Energy and Arch Coal. Meanwhile, activist investor Carl Icahn took an 8.5-percent position in copper miner Freeport-McMoRan, which we own. Late last month, Freeport became the first major miner to announce production cuts in response to depressed copper prices, which have slipped around 19 percent since their 2015 high of $2.95 per pound in May. This reduction should remove an estimated 70,000 tonnes of copper from global markets, according to BCA Research, and eventually help support prices. Platinum and palladium miners in South Africa, a leading producer of both metals, also announced job cuts and mine closures, as platinum has slipped more than 16 percent this year, palladium a quarter. Marc was referring, of course, to China, the 800-pound commodity gorilla, as I’ve often described the country. 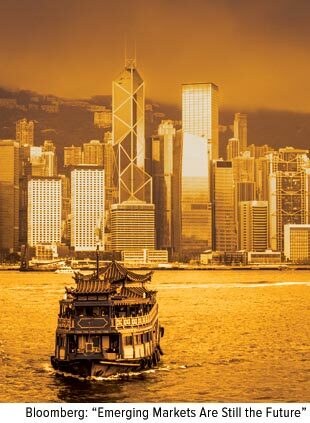 The Asian powerhouse is currently responsible for nearly 13 percent of the world’s commodity demand, followed by the U.S. at a little over 10 percent. The JPMorgan Global Manufacturing PMI continues to decline as well. Since its peak in February 2014, the reading has fallen 4.5 percent. The August score of 50.7, just barely indicating manufacturing expansion, is the sixth consecutive monthly reading to remain below the three-month moving average. The opposite has also been true: Prices have a stronger probability of ticking up three months after the one-month crosses above the three-month. This is why we believe prices will have a better chance at recovery after the global PMI crosses above its three-month moving average. I have great respect and admiration for Druckenmiller, Soros, Icahn and Marc—all of whom are clearly bullish on commodities—but we would prefer to see global manufacturing growth reverse course. In the meantime, low commodity prices are a windfall for many companies in Europe, Japan and the U.S. Metals and other raw materials are at their lowest in years, which is the equivalent of a massive tax break for the construction and manufacturing sectors. Low gold prices are also expected to generate high demand in India as we approach fall festivals such as Diwali and Dussehra, not to mention weddings. According to estimates from Swiss precious metals refiner Valcambi, demand could reach 950 tonnes by the end of the year, compared to 891 tonnes in 2014. Before you gold bulls out there cry ‘rubbish’ it should be borne in mind that last year was a disastrous year in dollar terms for virtually all commodities across the board. Only four internationally traded commodities showed gains over the year, while gold was the least bad negative performer among the rest with a drop of only 1.7% – but has now shot up nearly 10% since the start of the year. Indeed, as we pointed out in a recent article, gold performed positively over 2014 in virtually every currency other than the U.S. dollar. So despite being a disappointing year for dollar area gold bulls, it will have been a positive year in all non-dollar tied nations. We are indebted to Frank Holmes and U.S. 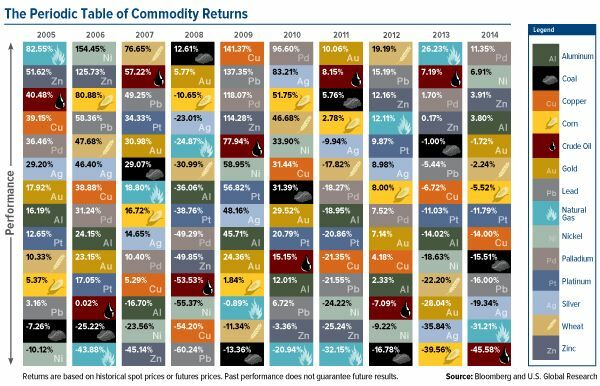 Global Investors for the graphic below which sets out the performance comparisons for the globally traded commodities since 2005. It can be see that palladium, nickel, zinc and aluminium were the only commodities which showed gains in price – with palladium the comfortable winner for the year. But gold, despite showing a small loss, performed hugely better than most other commodities like copper which was down a heavy 14% during the year. But even this was a small fall compared with crude oil – down 46% – and natural gas – down 31%. Even agricultural commodities like corn and wheat were down in price by much more than gold. A larger high res pdf version of this table is available by clicking on this link. While slower industrial growth than hoped in the West and the downturn in the Chinese economy primarily responsible for the weaker commodity prices, the prime culprit will have been the U.S. dollar which rose by 13% over the year against the basket of currencies against which the dollar index is measured. So in most currencies other the reversal in fortunes for commodities would not have been nearly so bad. While in dollar terms 2014 may well have seen the biggest commodity reversal in recent years (since 1986 in fact), in other currencies it will not have been nearly so bad. 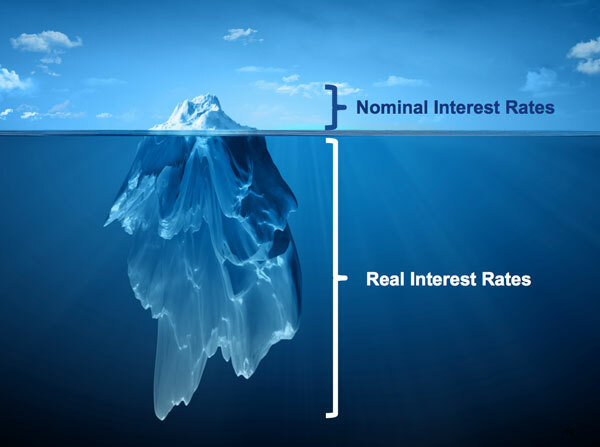 As we pointed out in our earlier article on the subject (see link at the start of this article), perhaps we are too fixated on the dollar as the reference baseline when making these kinds of judgements. 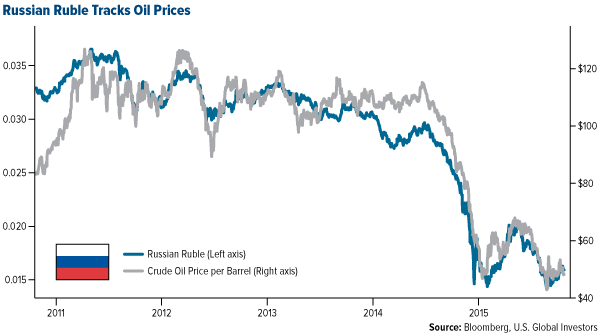 In the Russian ruble for example commodity prices will have been booming in 2014! Palladium’s performance to buck the overall trend with a significant rise of more than 11% was partly due to a relatively buoyant global market for automobile sales, coupled with an assumed supply deficit of over 1 million ounces in 2014 according to the platinum experts at Johnson Matthey. However there didn’t appear to be any significant non-availability of metal presumably because stockpiles at the main users have been well maintained when prices were lower. Platinum also saw a perhaps 1 million ounce deficit, largely due to the South African platinum mine strikes, but here the overall price still fell – perhaps because of additional supply coming out of the platinum ETFs.